Ulcer is a disease that unfortunately makes more and more victims each year, because modern lifestyle helps this disease to appear and advance. Ulcer is caused by a bacteria called Heliobacter Pylori, which billions of people are carrying. If a person that carries this bacteria lives a stressful life and eats a lot of spicy food (factors that help the bacteria quickly evolve) then he/she will most likely suffer from one of the many forms of ulcer. Ulcer occurs because this bacteria slowly eats the protective membrane around the lining of the stomach and exposes the sensitive tissue beneath it to the dangerous gastric acids inside the stomach. Therefore, ulcer causes an open wound in the stomach, esophagus or duodenum. If someone has discovered that he or she is suffering from ulcer then the treatment must start as soon as possible because if the disease is left untreated severe complications can appear. The treatment is simple, the patient is prescribed a series of medication depending on the type of ulcer and how advanced it is. But what happens if a person is not aware that ulcer is affecting him/her or if he/she simply leaves the disease untreated? Well an untreated ulcer can turn into a much worse form of ulcer - bleeding ulcer. 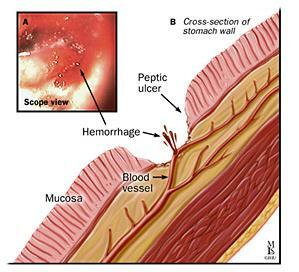 It's called bleeding ulcer because loss of blood occurs due to the fact that H pylori keeps eating the tissue until it reaches the blood vessels and blood starts to enter the digestive track. Someone that has bleeding ulcer will start vomiting blood, have black, loose stools, will start to experience pain in the abdominal area and indigestions will often follow a meal. In extreme cases, if nothing is done about the ulcer it will eventually lead to death, so bleeding ulcer must be treated immediately after it's discovered or its consequences will be felt in the entire body. Bleeding ulcer is treated through surgery in most cases, but surgery is not required if the illness is detected early. It is hoped that in the near future ulcer and bleeding ulcer treatment will be much easier because new medical tehniquies are researched intensively every day, since this disease affects more and more people and the situation is becoming alarming. In conclusion, if you suspect that you have ulcer or bleeding ulcer pay a visit to the local doctor and ask for his advice as soon as you can, because in the early stages both ulcer and bleeding ulcer are treated with just a few pills, which is of course much better that going through surgery and suffering life-threatening complications.